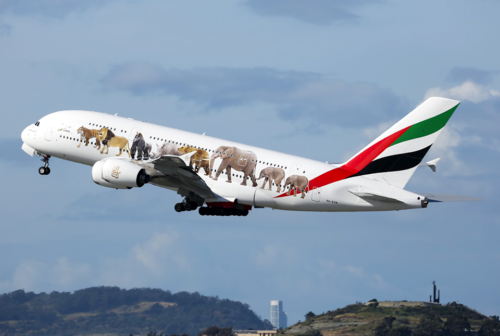 The commercial aviation industry is an unwilling partner in the illegal wildlife trade, which is valued at between $5-20 billion per year and is the fourth most lucrative global crime after drugs, humans and arms. Among the resolutions endorsed unanimously in Dublin this week by airlines attending the annual general meeting of the International Air Transport Association (IATA) is one which denounces the illegal trade in wildlife and wildlife products and pledges to join government authorities and conservation organizations in the fight against the traffickers of endangered animals. • Consider the adoption of appropriate policies and procedures to discourage trafficking through awareness programs, information sharing and incident reporting. One of the high profile efforts already underway comes from Emirates. In November 2015, the airline introduced two A380 jets with a special livery in support of United for Wildlife, the global collaboration that unites the efforts of the world’s leading wildlife charities in the fight against the illegal wildlife trade. A video describing the effort is also being aired on flights. In March 2016 IATA was one of the signers of the Buckingham Palace Declaration supporting the United for Wildlife Transport Taskforce initiative of The Royal Foundation of the Duke and Duchess of Cambridge and Prince Harry. The resolution also encourages airlines individually to sign the Declaration and more than a dozen did so at the IATA annual general assembly meeting.